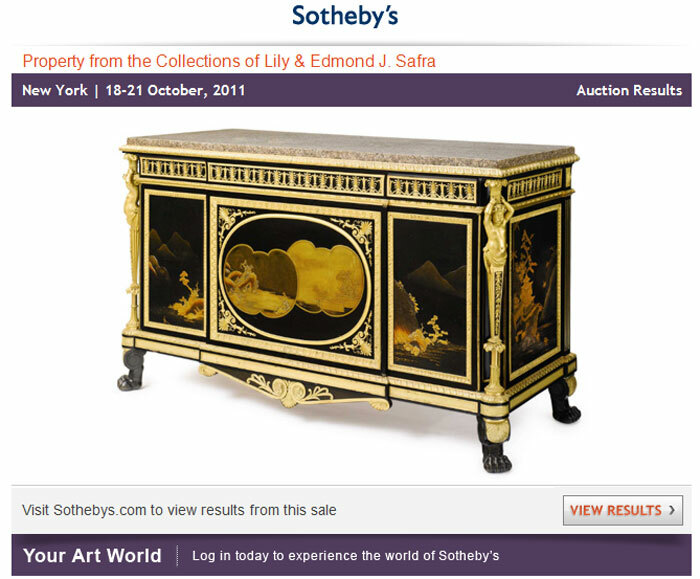 Six years after the landmark auction of Property from the Collections of Lily & Edmond J. Safra, Sotheby’s is honored to hold a second series of sales dedicated to the remarkable collections of Lily & Edmond J. Safra. The four-day auction is comprised of six sale volumes whose contents represent the pinnacle of their respective collecting categories, from magnificent European furniture and works of art to Russian porcelain, Cosway bindings and 19th century paintings and interior watercolors. 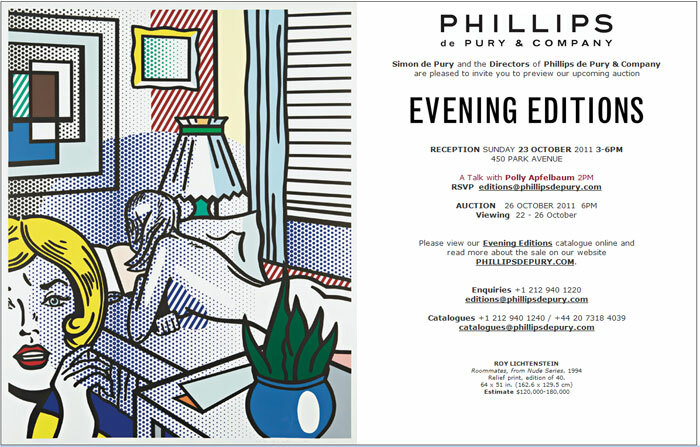 New York- Following on from the success of the first Evening Editions sale in April 2011, Phillips de Pury & Company is pleased to announce its second Evening Editions sale to be held at 450 Park Avenue during the start of New York’s official Print Week 2011. 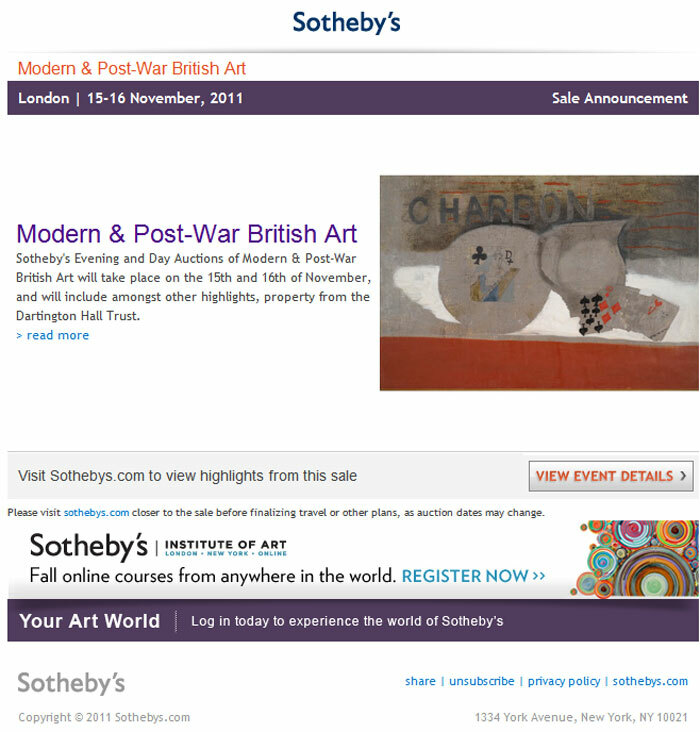 Following on from our record-breaking and best-ever season of sales in May and June, including the Evill/Frost Collection, Sotheby’s is pleased to announce its first ever Evening Auction of Modern and Post-War British Art on 15th November, with a Day Auction to follow on the 16th November. Season highlights include works by Edward Burra, Sir Stanley Spencer, Lynn Chadwick, Paul Nash, Henry Moore and Peter Lanyon, as well as works from The Dartington Hall Trust Collection, sold to support the Trust’s work in the Arts, Social Justice, and Sustainability, including works by Ben Nicholson, Christopher Wood and Henri Gaudier-Brzeska. 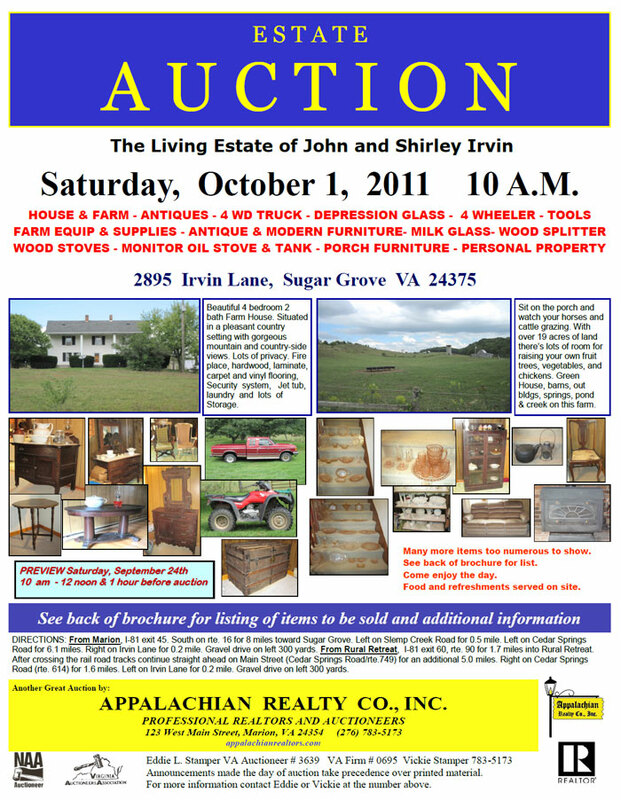 Our next auction will be on Saturday, October 1st at 10 am at 2895 Irvin Lane, Sugar Grove VA. 24375. This is in Smyth County. The Auction includes antiques collected over several years. Many of them have been in the family for years and this will be the first time they are offered for sell to the public. This sale will draw together some of the finest exponents of printmaking across five centuries, encompassing a variety of styles and techniques. Highlights from the Old Master section include Albrecht Dürer’s engraving Saint Jerome in his Study. Together with Melencolia, also in the sale, this engraving represents the pinnacle of Dürer’s achievement in this medium. Rembrandt Harmensz van Rijn is featured by a very fine and atmospheric impression of the first state of Faust. The Modern section comprises an interesting group of works by Pablo Picasso including a series of etchings from his early period in Paris, known as La Suite des Saltimbanques. The printed work of Joan Miró is represented by a number of rare artist’s proofs which illustrate his collaboration with the printer Mourlot. These were acquired by the present owner directly from the famous French printer who became a reference point for important 20th Century artists. Eminent artists such as Andy Warhol, Roy Lichtenstein, as well as Keith Haring, Richard Hamilton and Damien Hirst feature in the Pop and Contemporary section. Responding to the ever-growing demand for quality works in this field, Sotheby’s New York Classical Chinese Paintings Department is dedicated to providing our global clients a market alternative outside of Asia. The September sale consists of 83 diversified works from the Ming and Qing dynasties, as well as a few modern and contemporary works that were executed clearly in the classical manner. 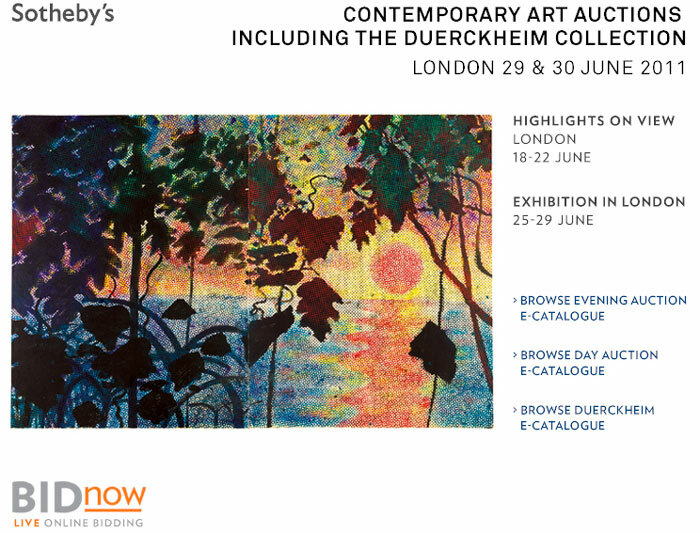 The Contemporary Art Evening Auction on 29 June in London will present a selection of works of major significance, including 34 lots from The Duerckheim Collection, the most important private collection of post-war German Art ever to be offered for public sale. The Duerckheim Collection includes early and formative masterpieces by Georg Baselitz, Gerhard Richter, Sigmar Polke, Blinky Palermo and several others, which document their exhilarating advancements of the 1960s. The appearance of paintings of this quality, art historical significance and freshness to market is exceptionally rare and represents a very special auction moment. The Contemporary Art Day sale held in London on 30 June includes classical pieces from the notable movements of the Post War period, along with paintings and sculptures by the leading names of the contemporary art world. The morning session is highlighted by twenty five works from The Duerckheim Collection, a remarkable grouping of masterpieces from the 1960s and early 1970s by pioneering German artists, including Gerhard Richter, Sigmar Polke and Georg Baselitz. The ensemble is a resounding testament to the vision and expertise of its collector, Graf Duerckheim, and stands today as an in depth archive of German art from the post war period. The day sale selection comprises important works by Jörg Immendorf, Imi Knoebel, Markus Lüpertz and A.R. Penck among others. Other post war highlights include a beautiful example from Fontana’s famous ‘tagli’ series, Concetto Spaziale, Attese a rare ‘Hero’ work on paper from 1967 by Georg Baselitz, as well as works by the master of Pop, Andy Warhol, minimalist artist Dan Flavin, and a vibrant work on paper by Jean-Michel Basquiat. Circa-1795 Eli Terry tall case clock, one of only three whose movement and case were both crafted by Terry himself, est. $20,000-$30,000. Morphy Auctions image. DENVER, Pa. – Just as there are comfort foods, there are also comfort objects – decorative antiques whose beauty and superior craftsmanship render them icons of stability in an era of plastic and impersonal mass production. Early American clocks, artist-decorated pottery and hand-filigreed antique jewelry are comfort objects, and all may be found in abundance at Morphy’s June 25 General Antiques auction. The 500-lot auction includes more than 40 tall case and mantel clocks, with the star lot being a circa-1795 Eli Terry production. “Eli Terry (Connecticut, 1772-1852) was the father of American clock making,” said Morphy Auctions’ owner, Dan Morphy. “The tall-case clock in our sale is extraordinary because it is the third of only three such clocks for which Eli Terry made both the movement and the case. The other two clocks are in museums. The one consigned to our sale is the only one of its type to be offered for public sale in more than a century.” In 2010, one of the other two Eli Terry clocks was appraised for a museum on PBS Television’s Antiques Roadshow and was valued at $25,000, minimum. The 93-inch-tall Eli Terry clock in Morphy’s upcoming sale features a handsome mahogany case with excellent original finial and possibly original finish. It has a wooden movement with calendar, sweep-second hands and original tin can weights, and is in overall excellent condition. Accompanied by extensive written and photographic documentation, this recently discovered clock is expected to make $25,000-$60,000 at auction. The clock section also includes a rare, primitive-style Flemish tall case clock, est. $4,000-$6,000; and an American Chippendale cherrywood tall case clock, est. $4,000-$8,000. A collection of desirable skeleton clocks joins the larger timekeepers, with highlights being a 2-train example with cable-driven fusee, est. $1,200-$1,800; a miniature “great wheel,” est. $600-$1,200; and a French miniature “post” clock, est. $900-$1,500. The overwhelming success of Morphy’s Feb. 26 Fine Jewelry sale led to the consignment of 100 luxe pieces from two separate collections. A chic 14K white gold ring with a 3-carat center diamond is estimated at $15,000-$25,000; while a filigreed 18K gold, diamond and sapphire ring weighs in with a $10,000-$15,000 estimate. Also featuring very fine filigree work, a ladies’ hand-made 18K cast-gold coin holder could realize $4,000-$6,000. More than 200 lots of pottery will be auctioned, including a single-owner 20-piece collection of George Ohr designs consigned by friends of the Ohr family. A 3¾-inch bowl with crimped edges, a 3-inch dark metallic bowl and an unglazed bowl finished in bright colors are among the top lots. Each is signed and carries a presale estimate of $600-$1,200. Rookwood iris-glaze vase, 1902, decorated by A.R. Valentien, full signature, 15 inches tall, est. $17,000-$22,000. Morphy Auctions image. 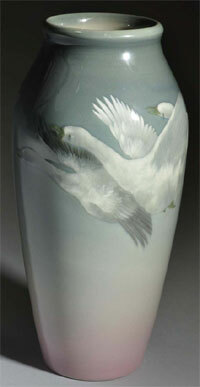 An exceptional 15-inch iris-glaze Rookwood vase with a depiction of geese in flight leads the Rookwood category. A masterwork hand painted in 1902 by Rookwood’s renowned art director A.R. Valentien, the vase bears Valentien’s full signature and could finish in the $17,000-$22,000 range. Other notable Rookwood lots include a 13½-inch Sara Sax avian and floral design executed in 1916, est. $6,000-$7,000; and an 11-inch scenic vellum vase by Ed Diers, $2,000-$2,500. Several other premier potteries are represented in the sale. 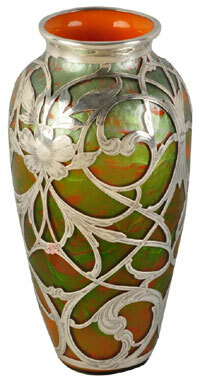 A Teco Arts & Crafts green matte glaze vase stands 12 inches tall and is estimated at $2,200-$2,500. An 11-inch Grueby bulbous vase could reach $1,500-$2,000; as could a 28-inch Roseville Bonita jardinière and pedestal. A coveted Newcomb College Pottery 11-inch bud vase in blue tones is stamped “AFS” for student artist Anna Frances Simpson, and is assigned a presale estimate of $6,000-$8,000. A stunning 10½-inch art glass vase with silver overlay, possibly of Austrian origin, is entered in the sale with a $6,000-$9,000 estimate. Another glass highlight is the set of six signed Tiffany Studios gold-colored tumblers, $1,000-$1,500. The primitive charm of stoneware is on display with a collection of more than 30 chicken feeders. Each of the blue or yellow stone feeders is attractively decorated, many adorned with cheerful images of hens or chicks. Other decorative-art standouts include a 37-inch-tall Ming Dynasty polychrome-painted Buddha, $2,000-$4,000; and a magnificently carved ivory Asian urn, 24 inches tall with teak base. The urn is from a long-held single-owner collection that also includes two 11-inch ivory tusks carved with images of men and women at work. 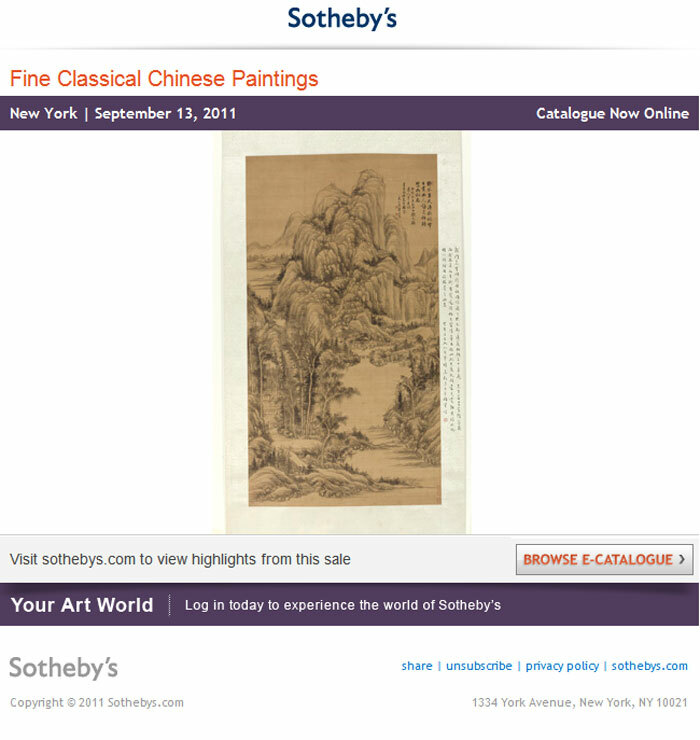 The tusks – likely Chinese artworks – are offered as a single lot with a presale estimate of $3,000-$5,000. From a British collector comes an array of more than 30 biscuit and sweets tins, including several sought-after forms. A 1915 Robertson Bros. (Canada) bas-relief golf bag tin that once held chocolates is decorated with images of a man and woman golfer in vintage attire. It is estimated at $1,200-$1,500. Biscuit tin highlights include a 1913 Huntley & Palmers “King Wenceslas,” $1,000-$1,500; a Crawford’s “Fairy Tree” with Mabel Lucie Attwell design, $600-$900; and Huntley & Palmer’s “Plates” and “Shell” tins, each estimated at $600-$800. 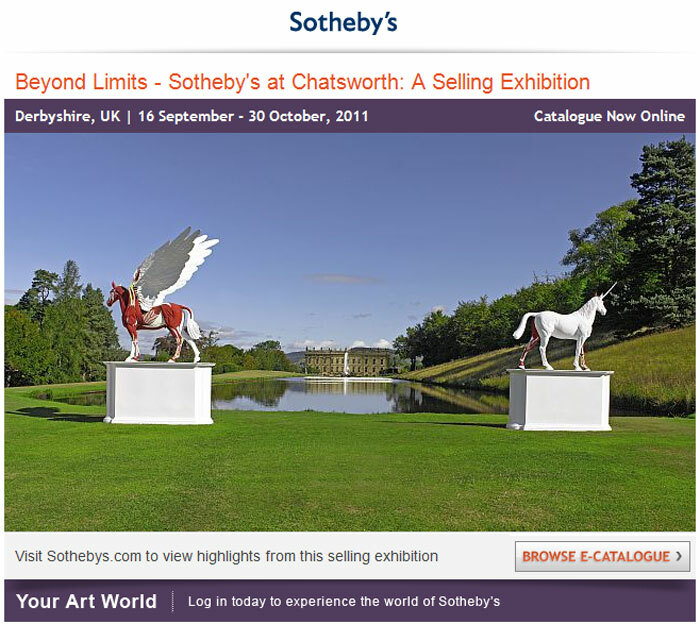 All items in the June 25, 2011 auction are currently on display and available to preview at Morphy’s gallery. All forms of bidding will be available, including live at the gallery, phone, absentee, and live via the Internet through Morphy Live or LiveAuctioneers.com. For further information on any lot in the sale, call 717-335-3435 or email serena@morphyauctions.com. 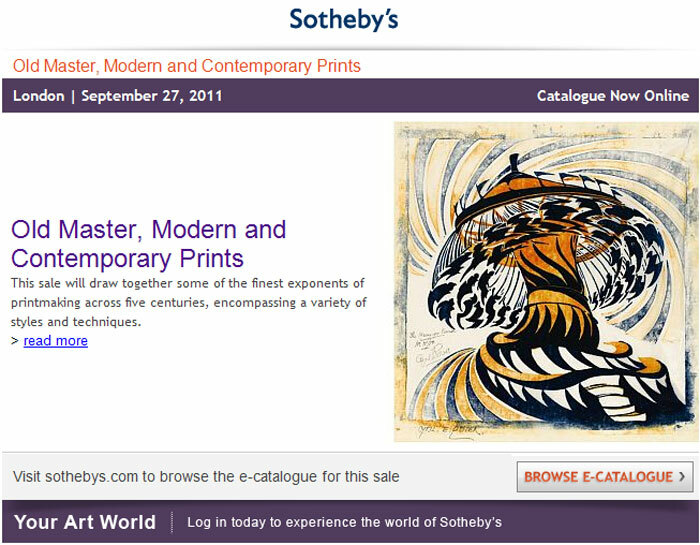 View the fully illustrated catalog and all other auction information online www.morphyauctions.com. 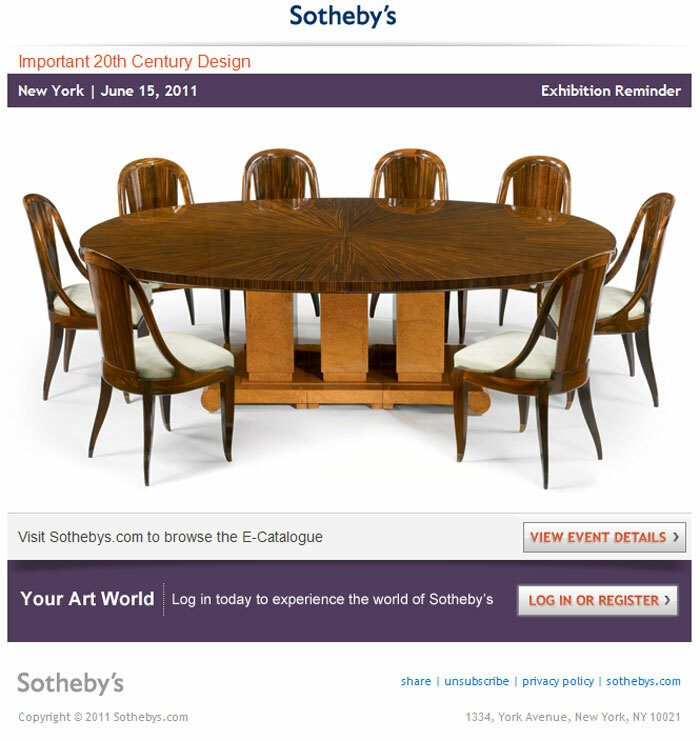 On June 15th Sotheby’s 20th Century Design department is delighted to offer an exciting collection of both American and European masterworks in the Important 20th Century Design auction. This auction includes the final chapter in an Important Private Midwestern collection, featuring a superb dining table by Emile Jacques Ruhlmann formerly in the collection of Andy Warhol. In addition to this extraordinary table, the collection contains a remarkable “Ananas et Grenades” Plafonnier by René Lalique and other significant Art Deco works designed by Ruhlmann, Chareau and Brandt. Alongside this private collection, Sothebys is presenting further French Art Deco masterworks, including an extraordinary set of eight “Cannelée” dining chairs executed by Ruhlmann in dramatic ébène de macassar displaying the exceptional talent of this ébèniste. From the workshop of Tiffany Studios, on offer is an outstanding collection, featuring a magnificent “Hanging Head Dragonfly” floor lamp on an extremely rare favrile glass ball base and an important “Oriental Poppy” floor lamp. Other highlights in the auction include rare animalier works by Paul Jouve and Rembrandt Bugatti, American Modern lighting, a private collection of designs by Serge Mouille and a zoomorphic bar designed by François-Xavier Lalanne.